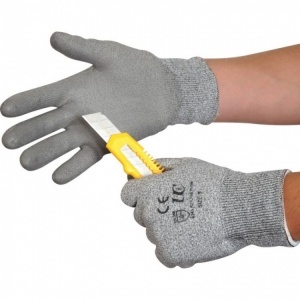 The Kutlass Level 3 Cut Resistant Gloves PU300 is machine knitted from a special high performance HPPE fibre to offer excellent cut protection at very economic price levels. The Kutlass Cut Resistant Gloves PU300 is further enhanced with an extremely light and flexible polyurethane palm coating offering good mechanical protection in dry handling situations. The breathable liner featured with the Kutlass Cut Resistant Gloves PU300 reduces perspiration and works in conjunction with the Sanitized hygiene function to increase comfort, freshness and odour prevention throughout use. The product code for these gloves is PU300. These gloves are absolutely brilliant, I've been using Kutlass PU300 gloves for over a year now, one pair lasted over a month with everyday use. 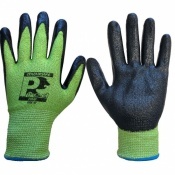 I'm a commercial electrician working on large electrical intakes, cutting steel trunking, Unistrut, drilling as well as large electrical cables, and these gloves have definitely saved my hands from injury. I find that when first worn they can be a bit tight which is a good thing for picking up small items, screws etc , but soon wear in after an hour or so, once worn in the you hardly know you're wearing them. I suggest getting a snug initial fit to get the best out of these gloves. Excellent product. I think I cut quite a dash in them. After using the gloves I am really pleased with them. A nice fit and very much up to the tasks for me. I replenish the Beers, Wines and Spirits for a Morrisons store. These gloves are excellent for gripping the bottles, they stop cuts from bottle-tops and cardboard. Very good value. Top quality gloves many uses including engineering, gardening etc. From the very helpful and professional lady who assisted with placing the order, to the excellent delivery time, I can certainly recommend your company to anyone wishing to deal with you.